During my not-so-recent trip to Tokyo, Japan last April, I bought a couple of things from MUJI. I got the usual stationary and some other little travel essentials. In Japan, though, I get the most excited about the MUJI food that they sell since most of what they’re offering is not available back at home. 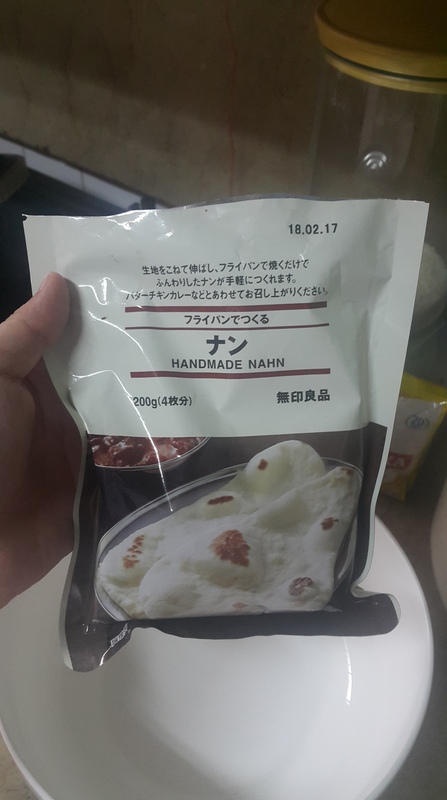 I was so happy to find a pack of handmade ready-to-make naan and couldn’t wait to try it out. The instructions were unfortunately in Japanese so I tried my best to (“read”) translate and research on what to do. Luckily, I found this video of someone making it and tried my best to follow. 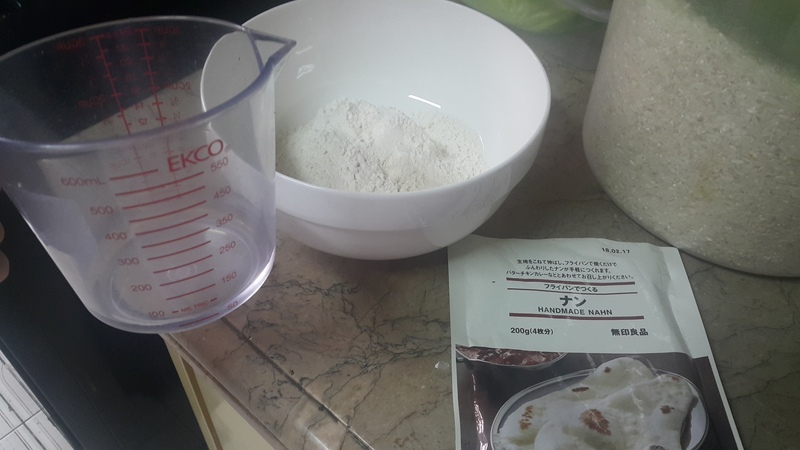 I combined everything well, kneaded the dough for a few minutes, and covered it to let it rise (as shown in the video). While I was waiting for my dough to “rise”, I heated up the MUJI Creamy Butter Chicken Curry. After ten minutes, I took out the dough from the bowl, cut them into four pieces, and proceeded to flatten them with a rolling pin. I grated some queso de bola (“ball cheese” or edam cheese, in English) and stuffed them in. 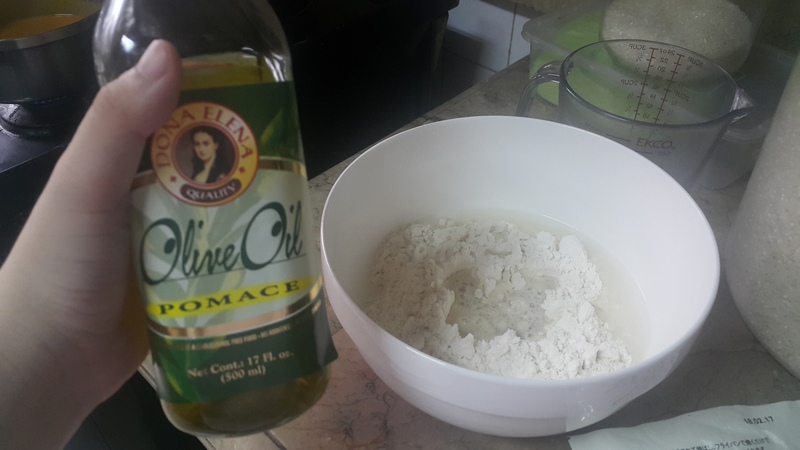 While I was rolling out and filling the dough, I placed a medium-sized non-stick pan over medium heat (read that again, slowly) and drizzled some olive oil on the pan. Once the pan was hot enough, I placed two of the naan bread on it and covered the pan (to trap the heat in). I let it cook for around 3 – 5 minutes on each side (or until they turn golden brown). Annnnd – the final product! It was surprisingly good (both the naan and the curry). The naan was soft and filling and the cheese really gave it a slight flavor boost. Even if it looked small, it was really filling. The curry was flavorful and light – not to mention good enough for two people. I would definitely hoard some more of these the next time I see it. I was surprised it tasted pretty good since I’m usually skeptical when it comes to ‘easy-made’ or ‘ready-to-cook’ products. Looks awesome! 🙂 Usually, naan is cooked in a clay oven (explaining the burnt / toasted portions) but the frying pan method works too – seeing how it turned out. The curry got me curious though; does it taste like CoCo Ichibanya’s, or it’s different? Hi! 🙂 I was really surprised with how it ended up looking + tasting! It’s as if I cooked it in an actual clay oven, haha.